The ultimate sweet & savory experience! 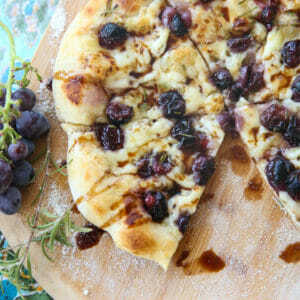 Roasted grapes, creamy brie, and fresh herbs on the an authentic brick oven style crust. This recipe is scaled for a smaller, 10-12 inch pizza. Additional olive oil and kosher salt. Place grapes on a baking sheet, drizzle olive oil over grapes and toss to coat. Sprinkle with salt and rosemary and bake for (20-30 minutes) 25 minutes, until grapes start to burst and caramelize. Remove from oven and set aside to cool. Stretch pizza dough out onto your prepared peel. Drizzle lightly with olive oil and sprinkle with a little kosher salt. Slice brie (with or without the rind, I prefer it without) and place on crust. Dot with grapes. Sprinkle with a little extra rosemary and bake using one of the methods outlined in the pizza dough post. After the pizza cooks, if desired, drizzle with additional olive oil and/or balsamic.